​The performance of the musical will feature musical theatre stars. Details to be announced. 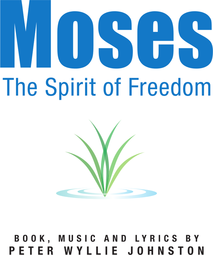 A few excerpts from Peter Wyllie Johnston's musical, 'Moses - The Spirit of Freedom', to be performed in Melbourne in May 2019. The musical, during a lengthy period of development, with expert advice and input from leading musical theatre practitioners, was produced in London, New York, the International Barossa Festival of Music, and the Ford Theatre (Geelong Performing Arts Centre). Prior to this, workshops were presented in Australia and the UK. Throughout the process of development, the leading orchestrator, Julian Kershaw (Notting Hill, Harry Potter and The Order of the Phoenix, Sweeney Todd), arranged and orchestrated the score. (Left) Michael Cunningham as Moses. A concert production of the musical will take place in Melbourne in May 2019. Details TBA. Catherine Porter sings 'Guiding Star' (Zipporah's Song) from 'Moses The Spirit of Freedom' (Act II), London Production.